Pisolithus arhizus season usually starts sometime in August here in Northern California. Now that September is upon us, my largest dye pot is on the verge of overflowing with mushroom dye. Not only did I save last year’s leftover dye, I’ve found two new mushrooms this year, my Mom has several waiting for me at her house, and – honestly it’s a bit overwhelming. 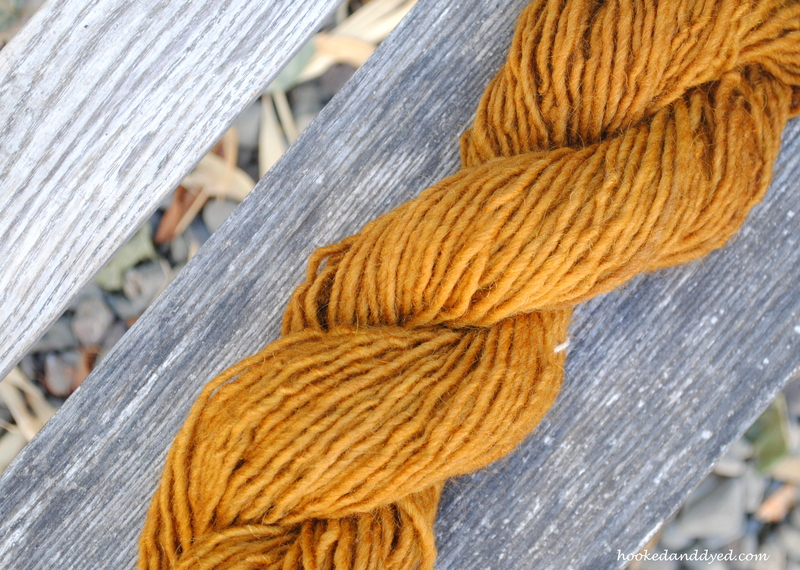 I’ve dyed enough times with this dyer’s puffball that the results are rarely new or exciting. 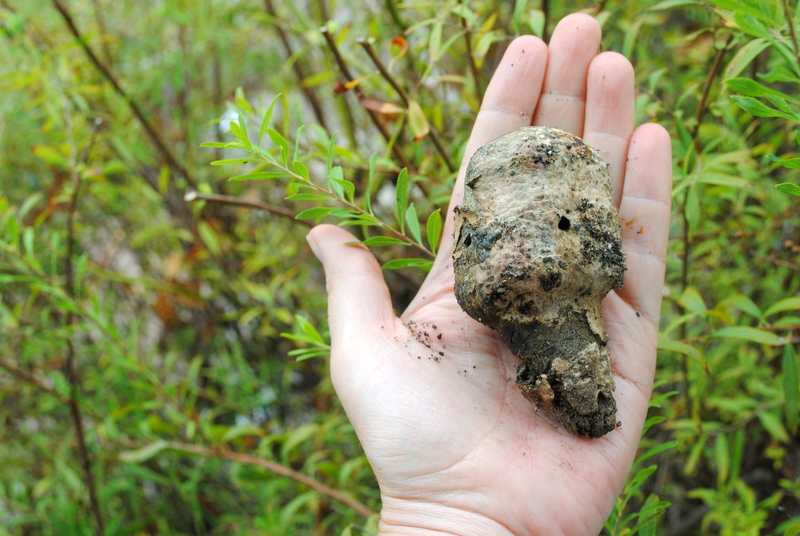 It’ll make brown – a beautiful brown – still, it’s brown. In the past I’ve always done a pre-mordant to my yarn, where I first mordant the yarn (in alum or iron) in it’s own water bath, then dye it. I’ve been taught that the mordant helps fix the dye to the yarn, which helps in color saturation and color fastness. Pre-mordanting the yarn works best, and doing a 28 day mordant is ideal. However, I changed this process for two simple reasons: quest to save water during our severe drought, and my laziness constant lack of time. I pre-mordanted 8oz of wool in alum several weeks ago. I was having a hard time tossing out the huge pot of alum infused water, just to make a fresh batch of mordant to pre-mordant another round of yarn. Seemed like a waste of water and time, right? Where did this auburn color come from? Why is the yarn striated? To answer my questions I did a second experiment. 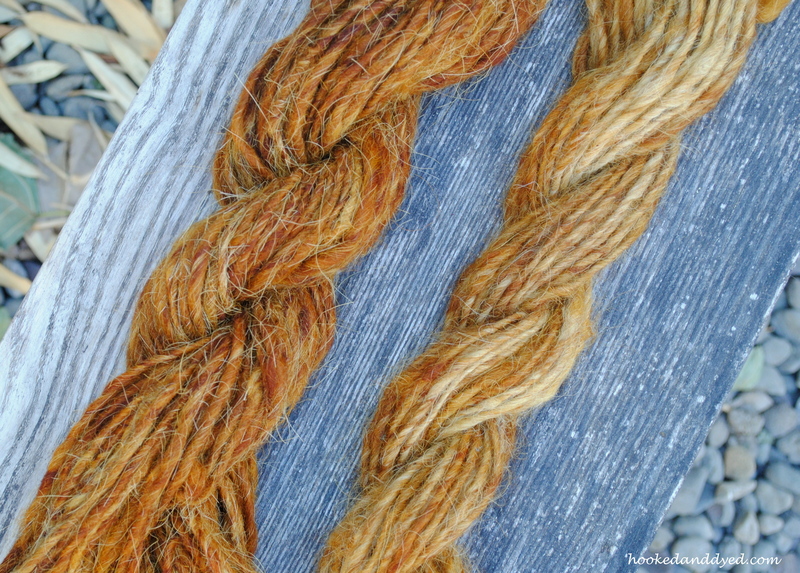 This time I used lamb’s wool to see if the striations were due to the dye/alum mix, or due to the fiber. 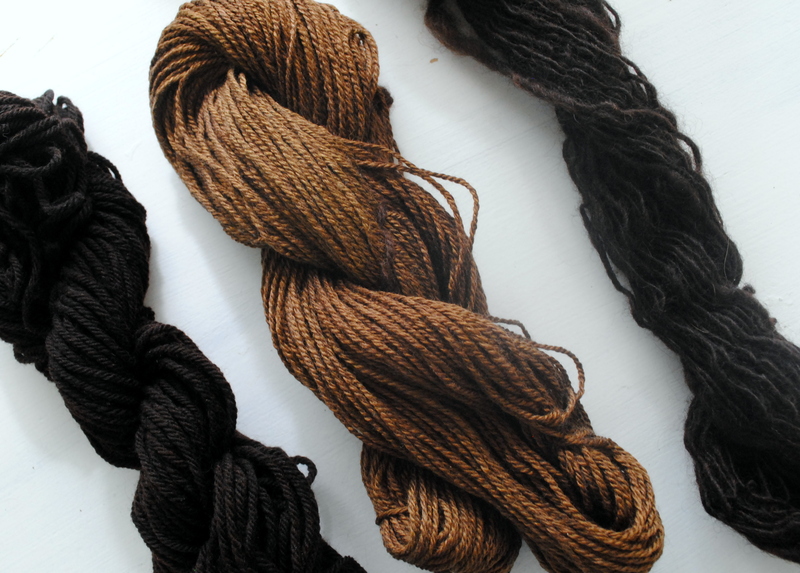 No striations on the second round of dyeing means the striations were due to the type of fiber, not the mordant. 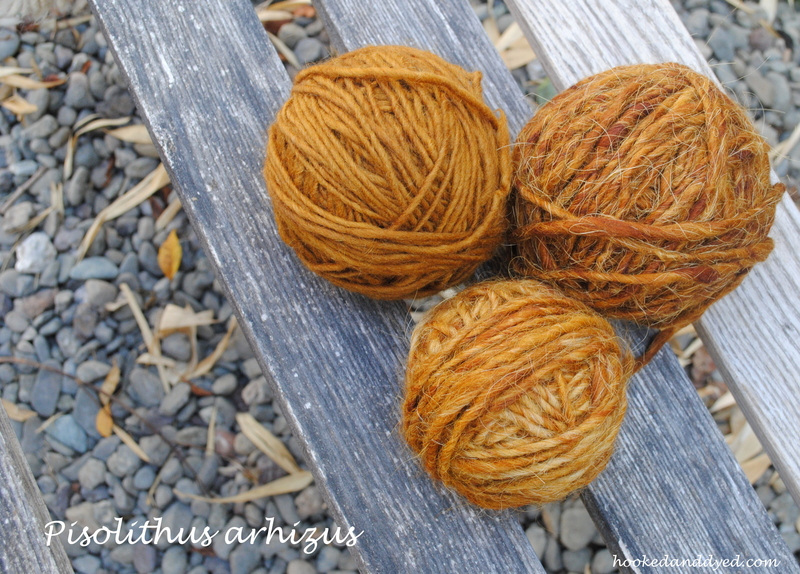 Both types of fiber turned brighter, with more auburn tones, than past results. I’m still unsure if this new color is from the alum being poured into the dye bath, or if I lucked out this season with fresher Pisolithus. I will continue to experiment with this new process of adding the mordant into the dye bath with a fresh batch of Phaeolus schweinitzii I found this week. 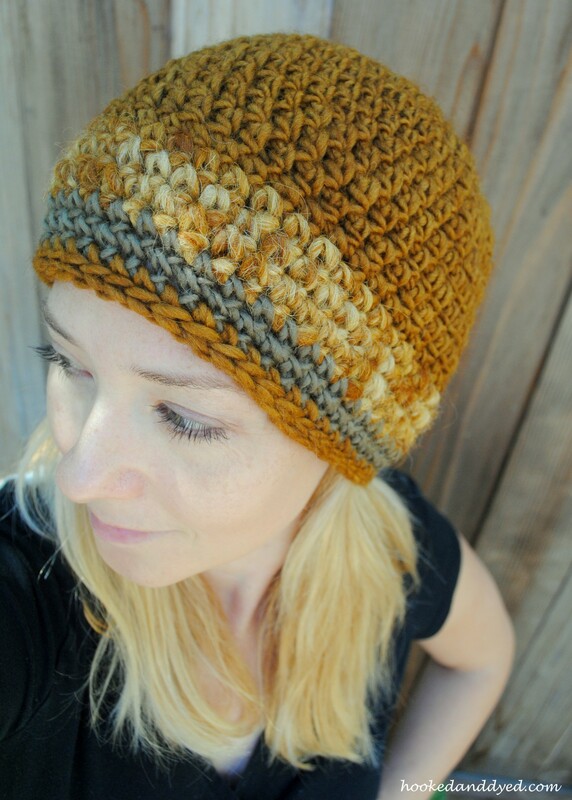 Until then – here are the fibers crocheted together in a hat, just in time for our first (hopefully not last!) rain of the season. Gorgeous colours, and all the more so from being naturally-derived. very cool! thanks for all the very useful info. Oh, what to oh and ah over first! Loved the middle brown but those orangey yellows are stupendous. It is also called…Waste not, want not!! So glad I found your blog. Thank you.